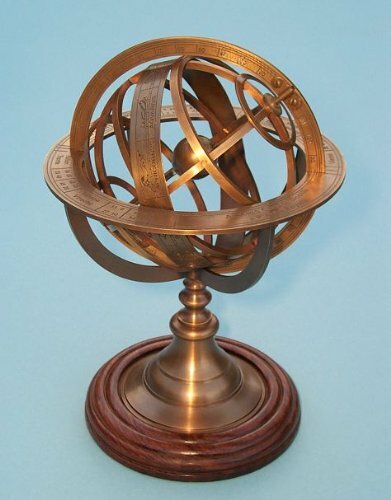 This armillary sphere is solid brass with a rich antique patina finish that will not tarnish or show fingerprints. The rims of the armillary spheres are marked "A PARIS Chez G. Gobille a P Ache Royalle." The heavy solid brass base is mounted on turned solid hardwood, and the bottom is covered with felt. The Medium Sized Brass Demonstrational Armillary Sphere measures 8 1/2 inches (21.6 cm) tall, 5 1/3 inches (13.5 cm) in diameter, and weighs 1.7 pounds (0.7 kg). Armillary spheres have become an icon of science with their elegant rings and beautiful silhouettes. Armillary spheres may have been invented by Eratosthenes around 255 BC. These instruments consist of a set of graduated rings representing circles on the celestial sphere, such as the meridian, equator, ecliptic horizon, tropics, and colures. With an armillary sphere, one could track the path of the sun for any given day of the year or determine a star's coordinates. The brass sphere at the center of the armillary represents the Earth. This beautiful and faithful reproduction of a European Demonstrational Armillary Sphere shows relationships among important lines and points in the sky such as The Celestial Equator, the Celestial Poles, the Ecliptic and the Vernal Equinox. The ecliptic rings are divided with the signs of the zodiac and these Armillary Spheres have an extra divided axis where the entire celestial sphere can be set to any angle.